We had our first huge rain of the season (rains came really late at the very end of April). It was so nice for all of the country, and things are already miraculously turning green. It is a really amazing to watch how quickly the land changes! The bad news is, we learned how the Club handles rain. The building did well, but the problem was underground. The sewage lines backed up out in the road, and you will never guess what happened. Yes, the worst thing possible…we are the lowest sitting building, so all of the “agua negra” came flowing back up through our pipes and drains and into the building! It was quite an adventure, as you can imagine, but Praise God we only lost a little bit of food and our staff managed to reroute the flow to the outside. 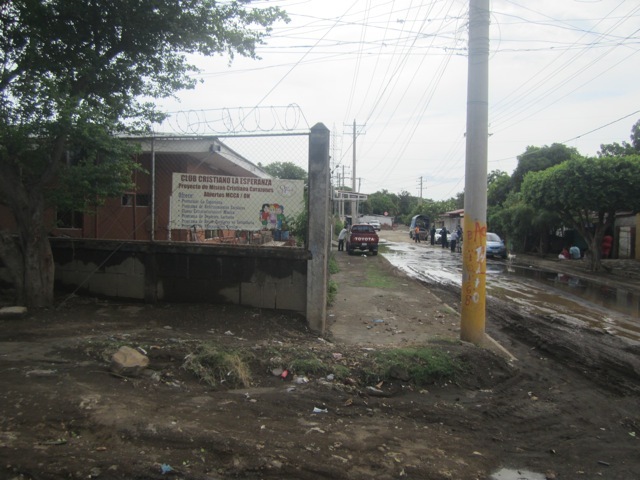 The next morning, we called the Water company and because we are on the new road into the new La Chureca community, they came pretty quick and pulled up the manholes and cleared the lines. This was not what we were hoping with the first rain! We are going to install a shut off valve on our sewage line this week. So if it happens again, we can close the lines! Please keep praying for all of the activities at Club Esperanza and for the ministry as a whole. We have already had a fun beginning to summer with the kids! It is still “under construction” but please do visit. Any help or suggestions would be great! ← Look What Timo Found!! !